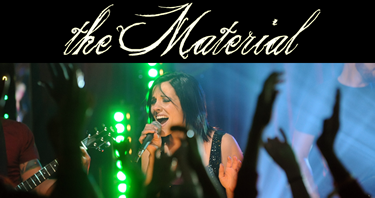 I just caught up with Roi, who is the one of the guitar players in the band “The Material.” They are a very talented five-piece band that hails from the west! If you haven’t heard of them yet, definitely check them out. Below is the interview….Enjoy! So, what’s the history of The Material? How long have you guys officially been together, how’d you all meet? Jon and Colleen met in high school after being introduced by their mutual friend Mike (singer of Halifax). Colleen migrated to San Diego to pursue a Music degree at SDSU and Jon followed a little later. Noah was a friend of Colleen’s that she had met at work. The three of them began practicing with Kevin Faulk (Every Time I Die) on bass. Kevin eventually left and they found Brian and I through the wonderful world of craigslist. The Material has been together for 2 years total the current line up since Feb 2007. What’s your writing process? Is it always this way? Do you use any FX at your live shows? If so what kind? We use a lot of effects for our guitars. Delay, reverb, phase, univibe, chorus, wah, ring modulator…we are no Mars Volta but, we use what is necessary to be sonically pleasing. What would your dream show be, if you could play with any band at any venue? A Radio Station That Adapts To You! Pandora Radio is truly amazing, not to mention that it is completely free! If the fact that it actually adapts to you doesn’t impress you, then check out the user interface. The people over at Pandora have been working on a huge project called the “Music Genome.” It not only gives you what artist you like, it describes to you exactly what kind of a song your listening to. For example, if I type in “Sick Puppies”, than it will tell me exactly what they are catagorized as in the Music Genome Project and continue to play the music that I like. Make Music? Submit Your Work To Pandora Radio! If you are a musician with a working demo than you can submit your music for the world to listen to! It is somewhat of a small process, but it is highly worth it to get your music the exposure. Click here to get started! If your into upbeat sound and overall amazing music, then you definitely need to check out this 5 piece band. Four out of five of the members do vocals, which leaves them no room for unoriginality. Wanna hear them? Click Here.